Hmmm... how to describe my bugs on sticks? Well, you see, they're... bugs... on sticks! 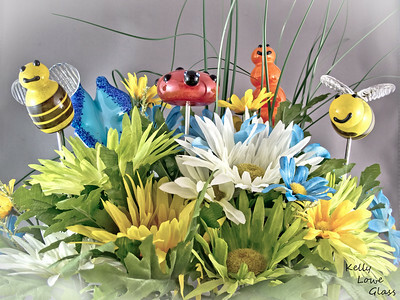 And by "sticks" I of course mean rods of solid stainless steel, and by "bugs" I mean hand sculpted cute little characters who'll add a little special flair to your garden, flower pot or vase. Or anywhere else, really, I mean they're not too picky - as long as they get occasional sunlight, fresh air, and roast duck on Thursdays, they'll be as content as a bug skewered with steel can be! The Original Crew: From left to right: Bee, Butterfly, Ladybug, Caterpillar and a Bee. As each bug is hand made - without molds - while the glass is still in a molten state, it's impossible to make each piece exactly the same. For this reason each bug will look different, or have its own "personality" if you will. I take special care to ensure the finished bugs are all cute though! Ladybug - Picture 1/2 An aphid eating machine, the ladybug gets along well with all type of flowers and fernery. 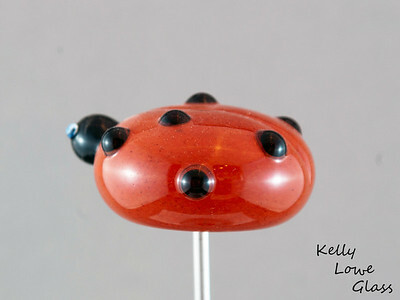 The ladybug is made of solid glass mounted securely atop a stainless steel rod. 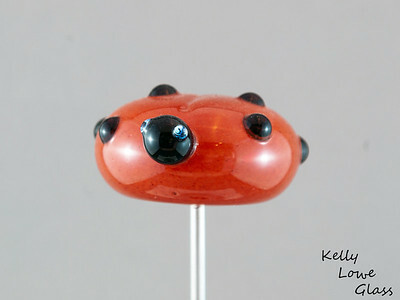 Ladybug - Picture 2/2: A side view of the dotted madame. 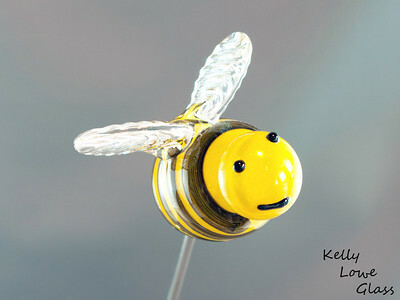 Bee - Picture 1/2 Soaring majestically through the skies on wings of glass, this bee stands guard over your flowers against bear invasions. Bee - Picture 2/2 Buzzzzzzzzzzzzzzzzzzzzzz!!! 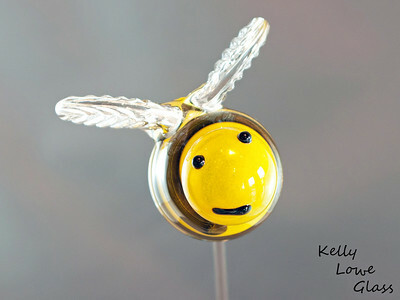 Buzz buzz buzz... bu bu bu buzz. Butterfly: Ah, the tranquil butterfly. 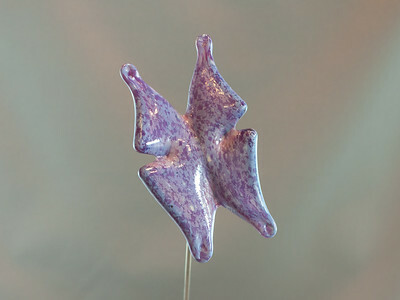 Adding this flower partner to your plants will bring good luck, cheer, and perhaps delicious tea. 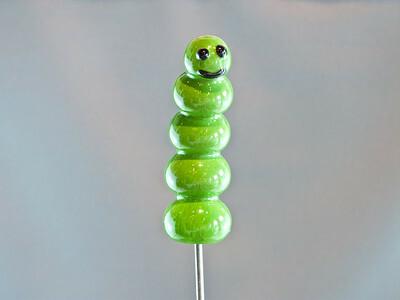 Caterpillar - Green Look at this face. Look at it! How can plants say no to this little guy? They can't, I tells you - they're forced to grow higher, prettier and more dramatic than any plant you've ever seen, all in the hopes of catching this little fellow's cheerful eye.